Discover how to improve your eye sight and see clearly without glasses/lenses!! The easy, affordable and natural way with eye exercises. "After four eye operations, 12 years in glasses and then contact lenses, and still having problems I started the Eyerobics program. In 2 weeks I started getting results and such clear vision that I removed my contact lenses and have never used them since. I made a visit to my eye specialist in Melbourne. I wanted an unbiased opinion so I didn't mention what I had been doing. After he examined me, he told me my eyes were great and I wouldn't need glasses or contacts again. I couldn't be happier with the results, so simple and yet noticing each day the major improvements." Tracey McIvor - Euroa, Victoria. Your vision isn't as good as it used to be and you're concerned it's getting worse. You suffer from an eye disease and you want to reverse it. You don't want to spend fortunes on new glasses/contacts or consultations. You're considering Lasik surgery but you're worried about the risks involved, the potential side effects and the huge costs. You would love having the freedom to see clearly without any aides. You don't have to wear glasses/contacts or resort to risky Lasik surgery to improve your eyesight. Have you noticed how you or other people wearing glasses will need stronger and stronger glasses over the years? Do you ever wonder why your eyesight seems to be continually getting worse? Just like most parts of our body, the eyes are controlled and focused with the help of muscles. If you put a lens in front of your eye to do the focusing work that your eye muscles are supposed to do, then your eye muscles won't do it! 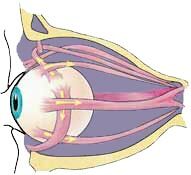 The eye muscles then get weaker from lack of use (known as 'atrophy'). Also the lenses you put on are set to one or two focal distances allowing you to see objects clearly which are on that focal distance. If you look further away or closer by than the lenses adjust wrongly as they can not bend like your normal lenses in your eye can (due to muscle pressure). And so next time you go to get your eyes tested, guess what? You'll probably need a stronger prescription because your eyes have become worse. And what does a stronger prescription do? Even MORE work that your eye muscles would normally be doing. Therefore the eye muscles become even weaker and then the next time you go to the optometrist. . . . . . . and so on. I must tell you , your program is working from Day1. Yes, yesterday , I received the kit, and its wonderfull. Specially the Pin Hole Glasses. Now I am more confident that yes even I can get clear eyesight. Your program is just WONDERFULL. And I am writing this mail without putting my glasses on. "Minus lenses are the most common approach yet the least likely to prevent further myopic progression. Unfortunately, they increase the near point stress that is associated with progression. "- May 1984, Optometric Extension Program Foundation. Wouldn't you like a simple yet effective alternative to the downward spiral of ever-worsening eyesight that restores your clear vision permanently? Welcome to Natural Vision eye exercises. "I've been wearing glasses since I was 19 years old. I always thought it was strange that every time I went to an optometrist, they told me something different was wrong with my eyes. The last few years I've been having trouble seeing into the distance. I started applying the Eyerobics eye exercises for about 5 minutes at a time every couple of hours. Also I started not wearing my glasses for two hours at a time. Within 2 weeks I noticed that it was hurting when I wore the glasses so I left them off altogether. I couldn't believe that after 12 years of wearing glasses how easy it was to not wear them. I thought my eyes had become too dependent on the glasses but it was so quick! I was carrying them around for another 2 weeks just in case I felt eye strain especially while I was driving but I never needed them." Brent Mitchell - Wodonga, Victoria. Getting rid of your glasses or contact lenses completely, and regaining your natural vision is actually much simpler than you can imagine. Fortunately there is a solution to all the frustration you've been experiencing. Now you have the chance to change your life! With Eyerobics, you will discover how to have the clear vision you want and deserve, how to have better eyesight without the aid of glasses or contact lenses. Even age is not an issue when it comes to Natural Vision Improvement. You've worn glasses for many years . . . is it too late? We are created with each part of our body designed to last us our whole lifetime (provided we look after them properly). Doesn't it seem strange that we are expected to believe we have a pair of eyes that will give up on us at age 35-40 no matter what we do? Why would your eyes fail just because you are getting older? Nature doesn't work like that. While the causes for failing eyesight are various (different stresses put upon the visual system, the use of glasses/contacts, too much reading/computer work, etc...) the many success stories of people using the Eyerobics Natural Vision Improvement program show that this method does work and could help you regain your clear sight no matter what your age and no matter how long you have been wearing your glasses. "It's just marvellous! I would highly recommend this program to anyone worried about his or her eyes. My eyes have definitely improved since I have been doing the eye exercises, and I've now discarded my distance glasses that I had worn since the1920's!" Loring G. Hudson (88yrs) Albury, Australia. Like every other part of your body, if looked after properly, your eyes need not deteriorate with age. Keeping your eyes active and exercised in the right way, maintaining a positive attitude and being aware of how to use your vision best can help to improve your eyesight and maintain your vision in optimum condition. Getting your vision back to normal is often a matter of 'physiotherapy', just like it is for other muscles. If you are experiencing eye strain or blurred vision, does that mean you have to get glasses/contacts? Are you noticing it's getting harder to read the telephone book? Worried about your driver's license eye test? Do your eyes get tired after reading for a long time? Straining to watch the TV? Do you have to push the book away from you to read the print? Can't read the street signs anymore? If you've noticed some vision changes, don't despair! Eyerobics may be just what you're looking for. Don't resort to wearing glasses/contact lenses when using this program can help you	have better eyesight and stay out of glasses. Forever! Gone are the days of an active life, outdoors, in fresh air and natural light. Changing focus from near to far used to happen more often in the course of our daily life. Most people now live in towns and cities, and work under artificial light and in air conditioned offices. If you read a lot, work indoors most of the time, or sit staring at computers all day in your current occupation, you may be starting to experience eyestrain or blurred vision. Sometimes this can simply be due to the incorrect use of the eyes. Staying looking at one focal distance for the whole day, for example, is not exercising the eye muscles properly. If you are concerned about your eyesight and want to preserve clear sight for the duration of your life, then Eyerobics can help you. With Eyerobics, you can learn in just half an hour, simple methods to aid in totally relaxing your eyes and relieving the discomfort of eyestrain giving you better eyesight. Discover how, with this simple, yet effective program, you too can help regain and maintain clear vision throughout your life, without resorting to annoying lenses or risky surgery! Get your eyes back to normal and keep them that way! "I have been using Eyerobics for approximately one month and have not worn my prescribed glasses in that time. I am amazed at the fact that I am now able to read fine print, for example the telephone directory. I have worn prescribed glasses for reading and driving for the last five years and they were always a hindrance to me, reading and drinking coffee, they fogged up, and driving I felt uncomfortable right from the beginning as I could not see clearly, however I persevered because of the advice of my optometrist. This is the first time in five years that I have been able to read my own handwriting without the use of glasses. It's so simple, I just do the eye exercises while I'm having my morning coffee. I am really thrilled with the results and don't wish to ever wear prescribed glasses again. I hope that people do Eyerobics to get the results that I have because it's just a joy not to have to wear them." Patsy Reid - Springhurst, Australia. Will Eyerobics work for my particular eye condition? Did you know that world famous author Aldous Huxley was pronounced clinically blind at age 19, using Braille to read and a guide to help him walk around? He adopted the same eye exercises as used in Eyerobics and was able to restore his vision to near perfect! His story is a testament to this revolutionary method and Huxley wrote a whole book about his success, called "The Art Of Seeing". "It would be good if other kids did Eyerobics so they wouldn't get teased at school and they would save a lot of money buying glasses. My glasses were $217 every time and now I don't need them." Over 12,000 people now benefit from knowing how to improve their vision naturally with Eyerobics. What makes this program so different and so successful, is that the method used is easy, affordable, safe, takes very little time and requires no study or expertise. It will not readily be shown to you by the average optometrist, yet it was designed by ophthalmologist (eye surgeon) W.H Bates, who treated thousands of people throughout his career, with great success. (Natural Vision Consultant), who studied and taught the method extensively, then distilled and condensed the knowledge, making it possible for many people to access this valuable information in an easy-to-use format. Already over 12,000 people have taken advantage of this great opportunity to preserve their natural vision and get rid of their glasses or contacts. "I wish to thank you most sincerely for sending me that simple but splendid information explaining how to look after my eyes. I must tell you that I have been wearing my glasses full time ever since I first got them, which would be about twenty years. There was no instruction from the eye specialist not to do so. After doing the eye exercises, I find that I can drive very well without glasses, and now I am getting used to not wearing glasses at home too. I know it will help to strengthen my sight as well as doing the exercises. Again my sincere thanks, my best wishes to you." Lucy Stratten - Armidale, New South Wales. Do you feel you don't have good discipline? We don't blame you. It's hard to find the time each day to do what you have to do, let alone to commit to an exercise program and stick to it. But the great news is that once you learn Eyerobics, you don't have to set aside any special time. The 10-15 minutes minimum required, can easily be spread across and incorporated into whatever you do throughout your day. There's no 'gear' to get, no motivation to find, no shuffling of your schedule to fit it all in. The eye exercises can comfortably slot into almost any routine, which is why so many people are finding it so easy to improve their eyesight with this program. "I received Eyerobics dubiously, on Friday 14th May and I am marveled by the significant improvement in my eyes. I have not worn glasses since 4 days after that, although I have needed them to assist me in reading for the past ten years. Being such a busy person, I thought it would be impossible to take time out to do the exercises daily, but they are so subtle and simple that I find I'm automatically slipping them into all the appropriate situations. And that's enough! It's amazing how consistent I am, mostly, I think, because I am now AWARE of how I am using my eyes and that makes me choose consciously to look after them. Why don't optometrists tell us this stuff? To experience something so easy and so beneficial to everyday life is wonderful. Furthermore, I have enjoyed showing the program to all who are cursed with glasses or contact lenses (and there has been) 100% keen interest in using it. My eyes thank you." Graham Nock (51 yrs) Woodlands, Western Australia. You could be getting similar results! Here are just some of the advantages you'll gain. Own a half hour, easy-to-use, follow along DVD filled with simple eye exercises tailored to your specific condition which you can do during your daily routine, without setting aside special time if you don't want to. Discover how to get rid of those inconvenient, expensive, frustrating glasses or contact lenses and stay out of them. Save the hundreds of dollars you would spend on constantly renewing your prescriptions and lenses. Avoid costly, unnecessary, risky surgery on your eyes. Avoid the inevitable downward spiral of worsening vision perpetuated by the wearing of glasses or contacts. Improve your chances of keeping your driver's or pilot's license. Have a way to take responsibility for your quality of vision and not hand your power over to people who may not tell you all the options. Receive a sample of the incredible 'Pinholes' which can speed up your recovery even more! Be able to play many sports again without fear of glass injury to the face. Protect your investment with our 12 month, hassle-free, money-back guarantee. Get lifetime support of a Natural Vision expert. Feel younger, healthier and more in control. Receive a customising chart so you can tailor the program to suit your specific eye condition. Stop wearing those annoying, expensive glasses/lenses! Seeing clearly without them can now be a reality for you too. Remember - glasses and/or contact lenses are not inevitable and do not improve your eyesight. In fact they may well be adding to your problems in the long term. Eye exercises have helped pilots, tennis coaches, many people with driver's licenses, computer operators, teachers, students, children, grandparents, librarians, doctors, web site designers, jewelers, business owners and more. Bottom line - the Eyerobics techniques help people from all walks of life imaginable improve their eyesight. And it can work equally well for you. Whether you're a long-time lens wearer or you're in the beginning stages of slightly blurred vision on occasion, this program will give you a powerful arsenal of tools for reclaiming and/or retaining your natural vision. What do you get when you receive this package? A half hour DVD with comprehensive accompanying information. The eye exercises are broken down into chapters, with headings and subtitles, which correlate to the list inside the video cover. Everything is covered in complete detail. Not only are you shown, step-by-step, what to do, but you can refer back to any of the eye exercises via a quick glance at the inside cover of the DVD. Besides teaching you how to regain and maintain your natural vision, the program has proven its effectiveness in the prevention and relief of most of the common eye conditions e.g. : short-sightedness, long-sightedness, astigmatism etc. A list has been included so you can customise your program to suit your particular eye condition exactly. Because we know your time is precious, we have designed the eye exercises to be easily incorporated into your everyday lifestyle, no matter what you do. It is very efficient both time and vision-wise. full 12 month money-back guarantee. Because this information is not readily available elsewhere, you may still have questions you'd like answered. So why not take advantage of Eyerobics' full after-sales personal support and advice (via email), from our Natural Vision Consultant for as long as you need it. Value over AUD $148.00 / EUR 90 / USD 133 per year. To help you track your progress, we will include with each DVD, a full size eye chart (usually found only at optometrist's), which you may put on your wall and use to monitor the improvement in your vision. Value AUD $25.00 / EUR 15 / USD 22.50. 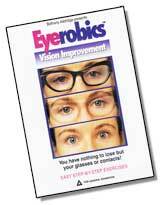 When you buy Eyerobics, you can subscribe to our newsletter FREE of charge. It is packed with the latest developments in vision improvement techniques, reveals more secrets that help you improve even faster, special reports from the world of Natural Vision Improvement, dangers associated with surgery, useful web sites, news on eye conditions/diseases etc. This newsletter alone is worth AUD $89.00 / EUR 54 / USD 80 per year. till end of !!! Take advantage and order now!! If this program was just another exercise program then maybe you could let it go past. But this is your eyesight - does it really matter what the price is? If you can retain or regain your natural vision, not have the inconvenience and discomfort of glasses or lenses, not have to undergo surgery and not have the embarrassment of ever-worsening vision, what is that actually worth to you? I can't put an exact dollar figure on it for you - maybe you can't either. But I can tell you that this program could very possibly be the best investment you'll ever make. We offer you a full 12 month, ironclad, hassle-free, money-back guarantee. This allows you to keep and use the video for a whole year. If you're unsatisfied for any reason during that whole 12 months, just return the DVD to us and we will promptly write you a cheque refunding every cent of the purchase price. You will have dramatic results within weeks of using this program and you have nothing to lose for we take all the risks! Don't settle for using lenses to see clearly. Use this simple, natural, and inexpensive vision improvement technique. Try Eyerobics and SEE FOR YOURSELF! Now that you know what's possible, you'll never again have to put up with the inconvenience, discomfort and frustration of wearing glasses or lenses. You can start improving your eyesight straight after you receive the video - no need to study books. All the knowledge and expertise comes to you in an easy-to-use package - just follow along with the video. You will not only be saving money whilst improving your vision, but freeing yourself from relying on artificial tools to see clearly. "After wearing prescription glasses since leaving school eighteen years ago, I was resigned to the fact that my eyesight would never improve. Constant book work, clerical work, and studying of computer screens, meant bad headaches and migraines. I noticed an immediate difference in my eyesight as soon as I began Eyerobics, four weeks ago. The colours and shapes I look at are much brighter and clearer. The strain on my eyes has greatly diminished and this has also improved my lifestyle health-wise. As a tennis coach I have to do lots of driving in and out of town, and it is so great not to wear glasses for that anymore. I reckon that anyone who really gives this a go will have success. And believe me - it's really worth it. I didn't enjoy wearing glasses at all." Peter Gould (37yrs) Albury, New South Wales. In short, with just a little of your time and a very small investment, it's possible for you to experience life-changing results. Act now! Place your order and get started restoring and/or retaining your clear, natural vision! PS: Remember, there is no real price you can put on your eyesight. And at any time over the whole next year, for any reason whatsoever, you are able to take advantage of our full money-back guarantee. Think of it this way - you have nothing to lose but your glasses or contacts. And there is an amazing opportunity to reap rewards that will cover the entire cost of the program many times over! Copyright 2012 Eyerobics Pty Ltd All Rights Reserved.